Editor’s note: Christian Le Mière is a research fellow for naval forces and maritime security at the International Institute for Strategic Studies. The views expressed are his own. It still amazes me how much media interest there currently is in the various maritime disputes of Asia. Five years ago, to find information on these then-obscure disagreements over tiny pieces of land required diligence and patience. Now, and in particular since the much-vaunted U.S. pivot to Asia, every week seems to bring new stories about these islands. It is therefore worth our taking a step back and asking how we got here. What have been the drivers for the maritime disputes over the past five years, do they share any similarities, and why, when these disputes have existed for decades, have they become so tense now? First, a reminder of the context. The islands in dispute are the Kurils (claimed by Japan and Russia); the Dokdo/Takeshima islands (South Korea and Japan); the Senkaku/Diaoyu/Tiaoyu islands (China, Taiwan and Japan); and the four major island groups of the South China Sea (in whole or in part by Brunei, China, Malaysia, the Philippines, Taiwan and Vietnam). Other island disputes exist in East Asia (such as the Northern Limit Line between the Korea), but these four comprise the most contested and contentious. These disputes are usually viewed in isolation, but there are similarities that they all share. Although claims of occupation and administration stretch back centuries, all of the disputes exist, to some extent, as legacies of imperial Japan’s expansion through East Asia in the first half of the 20th century, and its immediate withdrawal following its defeat in World War II. Before this period, most of the states in East Asia were too militarily weak to effectively enforce their claims; some were entirely occupied by imperial powers, and the modern international legal concepts of territorial sovereignty were arguably still alien to the region. Hence, all of these disputes have seen greater competition as regional states have improved their military and paramilitary capabilities. This not only allows them to occupy and administer islands at the edge (or even beyond) their territory, but it also makes nations more concerned about these peripheral concerns as they become more confident in their internal monopoly of violence. The stabilization of areas of East Asia following decades of war also allows the focus to shift from the land to the sea. In more recent years, the rise of China has inspired the greatest concern among its neighbors over these territorial disputes. Those countries surrounding China would point to its perceived “assertiveness.” The list of complaints is lengthy: in 1974 China’s People’s Liberation Army ousted Vietnam from the Paracel Islands; in 1988 the PLA fought Vietnamese troops over Johnson South Reef; in 1995 China occupied Mischief Reef; in 2009 a Chinese flotilla challenged the USNS Impeccable in its exclusive economic zone; in 2010 Japan claimed Beijing had used its trade as a coercive diplomatic tool by severely limiting rare earth metals exports; in 2011, Vietnam claimed Chinese civilian and paramilitary vessels had deliberately cut survey cables behind its exploration vessels; in 2012, the Philippines once again claimed Beijing had used coercive economic diplomacy by limiting banana imports amid the Scarborough Shoal fracas. Beijing would of course dispute this interpretation, despite the seeming weight of evidence ranged against it. Vietnam, for instance, has been far more active in occupying features in the Spratly group, and Vietnam and the Philippines have both been more vigorous in pursuing hydrocarbon exploration in the South China Sea. China is, in Beijing’s narrative, merely reacting to the aggression of others. Nonetheless, it is indisputable that China’s neighbors perceive assertiveness on its part, and this, in tandem with the impressive improvements in China’s military capabilities, is driving the procurement of military capabilities in the region. A further factor that has inspired fiercer competition has been the ability to exploit the likely hydrocarbon resources underneath the waters. It is of more than passing interest that the initial expansions of occupations in the South China Sea, in the early 1970s, occurred soon after a 1969 U.N. survey declared the likelihood of subsoil resources near the Senkaku/Diaoyu islands and the initial Sino-Vietnamese clash came just months after the oil price spike of 1973. In more recent years, China’s exploitation of gas in the Xihu trough in the East China Sea and licensing of blocks to foreign companies by Vietnam and the Philippines since the mid-2000s have all created friction between the disputants. Although no mineral resources have been tapped around Dokdo/Takeshima or the Kuril/Chishima islands, it is an often disregarded fact that rights to economic exploitation at sea stem from the land. Hence, sovereignty over any of the disputed island groups potentially grants hundreds of thousands of square miles of sea to be exploited. Given that all of the major economies of Northeast Asia rely on imported oil and gas for their energy needs, this issue has only increased in importance in line with the oil price. But this is not to downplay the significance of other resources: some estimates claim that up to 700 million people in the South China Sea region alone rely on fishing for their livelihoods. It is no coincidence that it was the attempted arrest of Chinese fishermen by the U.S.-donated Philippine flagship that began the stand-off at Scarborough Shoal. There are, of course, factors that are germane to any specific area that help explain why friction now dominates the tenor of the dispute. In the South China Sea, for instance, a May 2009 deadline for disputant states to submit their extended continental shelf claims led to a diplomatic flurry that heightened concern over the region, particular as China for the first time attached the infamous nine-dashed line to an official communication. Still, it is of interest intellectually and of relevance politically to point out that each of these disputes has seen an increase in antagonism at the same time. There is, though, one other similarity across these disputes that is perhaps more positive. Despite sometimes ostentatious military deployments, whether it’s the Russians currently fortifying their position in the Kuril Islands or China undertaking live-fire exercises in the South China Sea, thus far almost all altercations in these various disputed Asian waters have involved paramilitary and not military vessels. In fact, the various states, while building up their military forces as a deterrent measure (or possibly a coercive one in the future) have been careful to avoid confrontation between rival military forces. The use of maritime paramilitaries carries various benefits, such as a latent demonstration of sovereignty, but perhaps key among them is that it demilitarizes, and therefore deescalates, the encounters that occur on these seas. This suggests that while these disputes may remain intractable, no claimant is currently seeking a conflict-based solution. CHINA IS THE PRODUCER OF FAKE PRODUCT NO WONDER IF SHE PRODUCES A FAKE MAP CLAIMING THE ENTIRE SOUTH EAST ASIA. True. The land of fake and pirated goods and products. Those cheap but low quality imitations. how do you think about that American invaded afghan and iraq for oil,and now they want to invade Syrian? 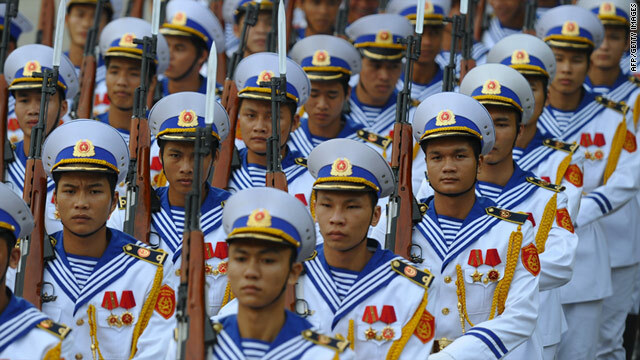 the photo is of Vietnam Navy,now the country is suppoted by US. why your Americans always want to be a teather to judge who is right who is wrong?Why USA army all around the world ?who can tell me why?you , to keep the peace?LOL! So many wars happened becuase you! Tell that to the Brits as they claim their rights over Falkland Islands which is some 8000 mile away from London. Well what you can expect from a country that elected a community organizer with no business leadership or any experience running even a small government. Sorry for the rest of the world that looks to the U.S. for leadership we have none. "...but it also makes nations more concerned about these peripheral concerns as they become more confident in their internal monopoly of violence." English, please? What in the world are you talking about??? Some excellent comments – and some expected bad ones, too – here about this issue. However, the geo-politics aside, I think the number one reason that nations are jockeying to make claims of islands are for the potential hydrocarbon $$$ benefits that can be reaped, as was so well stated in this article. Asian nations, with the exception of some of the central Asian republics that are rich in gas and oil, are forced to import most of their gas and oil. If a nation can claim sovereignty over an island group and its surrounding waters, then by legal definition, they own the mineral rights to what's under the sea. That would boost that nation's ability to rely less on imported gas and oil. At the end of the day, until we as a human society rely less on dirty fuels such as oil and gas that "fuel" wars, we are still on the same centuries-old trajectory of increasingly aggressive behaviors that lead to war. This is just more of the same old paradigm of reaping as much as you can from the earth now, and paying for the huge consequences it creates (ie. build-up of territorial disputes that lead to out-right wars) later. When you keep doing the same mistake over and over again, it's just plain stupid. This is another reason why the boldest nations (and I don't mean China or the US), are seriously investing in alternative energy sources for their people. "It is no coincidence that it was the attempted arrest of Chinese fishermen by the U.S.-donated Philippine flagship that began the stand-off at Scarborough Shoal." It's important to note that these Chinese fishermen were not innocently "just fishing", they were actually illegally poaching endangered species and harvesting corals. There are pictures on the net that shows Philippine Navy men on board the fishing boats and showing their crago. This is brought about by Chinese Communist Party that seeks more power in the region, breking into the peace. CCR should stop their attempt and bring back peace. Peace?are you joking? if you want peace ,How war happened in AFG? Why war happened in Irak?You make the world disoder,War happens here and there .where war happens ,where there is USA army,that is why? Please fix your grammar and spelling first before telling us about Peace. China's being a bully to other countries by aggression and invasion. Don't believe what your communist government tells you. Is Irag (after invasion by USA) better off now than 10 year ago? Who did the invasion. Almighty, peace lover USA. Common. Do not say other country is a bully if youself is. Why do I have a gut feeling that world war III is about to start.......over oil?????? american are all war crimial! obama is number 1 criminal! want to use other countries to start war with China. obama is a ganster!